Now that the turbines are up what are your thoughts on them? Lee Rand has two pictures on his lincolnmaine.us website. Boston, MA—December 3, 2010—First Wind, an independent U.S.-based wind energy company, today announced that it has obtained $98 million in financing for its 60 Megawatt (MW) Rollins Wind project in Penobscot County, Maine. First Wind closed an $81 million non-recourse construction loan and a $17 million letter of credit facility for the Rollins project. Key Bank National Association (KeyBank) and Norddeutsche Landesbank Girozentrale (Nord/LB) served as the joint lead arrangers for the financing. In addition to the financing, JPM Capital Corporation has executed a tax equity financing agreement with a subsidiary of First Wind. When the project goes into commercial operation, JPM Capital will provide long-term capital to take out the construction loan. Since the end of September, First Wind has raised $357 million in financing and repaid $118 million in short-term turbine supply loans. Financings include the funds for the Rollins project, $247 million for the 68-turbine expansion of its Milford, Utah project, and $12 million for its Steel Winds facility in Lackawanna, NY. First Wind could go under? What would happen to the turbines and access roads? The company intends to attract more private money to cut its debt and finance more wind farms in Maine. First Wind Holdings LLC plans to continue building wind farms in Maine, despite its failure Thursday to go public and sell stock to raise money. "We are continuing to move forward with our projects in Maine and elsewhere," said John Lamontagne, a company spokesman. "We're continuing with our strategy, and Maine is an important part of that strategy." Lamontagne acknowledged, however, that the company has yet to arrange financing for the 40-turbine wind farm it began developing earlier this month near Lincoln. The $150 million Rollins project is scheduled to be completed by spring, according to First Wind. But a financial analyst and critic of the wind industry said Thursday's events threaten First Wind's survival, and that it may need to tap a new round of federal stimulus funds to help pay for Rollins, which has a capacity of 60 megawatts. After months of preparation, First Wind abruptly canceled its plans to go public after its stock failed to launch within the price range the company was seeking. The Boston-based company had first hoped to raise as much as $312 million from its initial public offering. It wanted to sell 12 million shares of stock and price each share between $24 and $26. First Wind had planned to use money from the stock offering to ease its large debt load and fund future growth. Wednesday, on the eve of the IPO, the company reduced the estimated price range to $18 to $20 a share, or $228 million. But that 25 percent cut wasn't enough. Thursday morning, the company announced it was canceling the sale and released this statement: "While we received significant interest from potential investors during the marketing of our IPO, the terms that the IPO market was seeking at this time were not attractive to the company," said Paul Gaynor, CEO of First Wind. "First Wind is well positioned to grow in its core markets. We have a successful track record developing, building, financing and operating our portfolio of projects in the Northeast, the West and Hawaii." In Maine, First Wind operates two of New England's largest wind farms, Mars Hill in Aroostook County and Stetson I and II in Washington County. In addition to Rollins, it has begun construction on major wind farms in Vermont, Utah and Hawaii. It also has been considering other sites in Maine for wind energy development. First Wind has two large financial backers, the D.E. Shaw hedge fund firm and Madison Dearborn, a private equity firm. But the company has debt exceeding $500 million, and had planned to use money from the IPO to pay down loans. Lamontagne, the First Wind spokesman, said the company has demonstrated its ability to raise private money and will continue on that path. But William Downes, a Cape Elizabeth financial analyst, said he's skeptical that First Wind can attract the needed capital. "I don't know where they're going to get the money," he said. The Rollins project, Downes said, has the potential to be completed because it has a lucrative power contract that can be sold. It also could qualify for an extension of grants for renewable power, if the program is approved by Congress. But unless Shaw and Dearborn put in more money, or First Wind finds a buyer, Downes said, the company could go under. First Wind discloses this risk in recent financial filings. It says it has substantial, short-term debt and insufficient money to pay back loans. "Failure to comply with these obligations could result in an event of default under those agreements, which could be difficult to cure, or result in our bankruptcy," the company says. I realize that the wind farm is a very controversial topic in town. When my wife Katie and I moved back to the Mid-West this past summer we left with the notion that the project would probably never get off the ground. We figured that those turbines would be laying in the Chester fairgrounds for years to come or at some point would be moved to some other more accepting location. As time has passed though it seems as though the wind farm is likely to be erected at some point in the future. I can empathize with the residents in town who believe the turbines will obstruct Lincoln's natural views. And I totally respect the opinion that Lincoln is way too beautiful to have such monstrosities on our pristine lakes and ridge tops. I also agree that the economic boost First Wind is offering is minimal. The initial money will help but over time will there be any real economic benefit to having an industrial sized wind farm dotted around the town of Lincoln? This is a great question and one that deserves an honest answer taking into account our future as a civilization. Renewable energy is going to continue to play a larger part of our country’s energy mix. Right now total wind and solar power generated is minimal when compared to energy generated from fossil fuels like coal, natural gas and oil. Will this always be the case? Probably not, the costs of fossil fuels will likely rise in the future as the world recovers from this economic downturn, demand will turn upward and prices will move higher along with it. We only have to remember the summer of 2008 to recall a time when gas was $4 a gallon at the Sunoco station in town. Energy prices will likely rise again, there is really no doubt this will happen at some point over the next 2-10 years. And while Lincoln won’t directly benefit from the wind farm with lower electricity rates, it doesn’t take much foresight to see how the two could be connected in the future. Imagine the possibilities if First Wind was to sell off the wind farm years down the road. Lincoln, the state of Maine or Bangor Hydro could all be potential buyers for a much lower cost than is being invested today. This could potentially benefit the town or state greatly and could even affect electricity rates in town in a positive way. The wind farm could also bring stability to town. With a local electricity generation facility Lincoln could potentially be insulated from electrical grid black outs happening elsewhere in the state or country. If you believe in domestic energy or support “drill baby drill” then you should also support the wind farm. Wind energy created in Lincoln supports Lincoln in the same way that other places in the country benefit from coal or natural gas resources. If we visualize what our future as a society potentially looks like then there are many benefits to letting this investment enter the town. Think of it as an investment in the region. The towers, and energy generation potential once constructed will never leave. Of course some residents will be negatively affected more than others but for the majority this project will bring a major advancement to the area. It will put Lincoln on the map, in a good way by attracting eco-tourists who want to see the turbines and also green minded people who may want to support a clean renewable option to power their lives. The world is moving towards renewable energy technologies and Lincoln should get on board. While this may seem to only be the front of the wave, rest assured that wave is going to get much bigger. LINCOLN, Maine — A state law fast-tracking wind-to-energy projects is unconstitutional, and the state’s own peer reviewer admitted that state methods for reviewing project noise is flawed, an attorney opposing the $130 million Rollins Mountain wind farm argues in a brief submitted to the Maine Supreme Judicial Court. 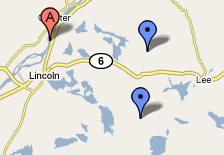 Representing the Friends of Lincoln Lakes residents group, attorney Lynne Williams, of Bar Harbor, claimed that the Board of Environmental Protection, which oversees the Maine Department of Environmental Protection, had no business approving the proposed 60-megawatt industrial wind site on Rollins Mountain. “Currently it’s based on industrial noise, not wind power noise,” the reviewer states, adding that “[w]e haven’t been able to determine whether this model is accurate for wind turbines,” Williams wrote in her appeal. The reviewer also stated that “wind turbine noise needs more investigation,” Williams wrote. The Maine Department of Environmental Protection issued First Wind of Massachusetts a permit for the Rollins Mountain project in April, Williams said, despite the reviewer never reconciling his expressed concerns with his ultimate approval of the project. The Rollins Mountain project is a 40-turbine industrial wind site proposed for the Rollins Mountain ridgelines in Burlington, Lee, Lincoln and Winn. Proponents have praised First Wind as a conscientious creator of wind power, saying the Lincoln Lakes project would create as much as 60 megawatts of pollution-free electricity in peak winds. The friends group contends the turbines would lower land values and threaten human and animal health with light flicker and low-decibel sound; disrupt the pastoral nature of Rollins; and typically generate a fraction of their capacity. Under the state’s fast-track law, Williams said, the friends group’s appeal must go to the Law Court, a requirement she called unconstitutional, as it denies appellants the opportunity to appeal to lesser courts first. Williams filed her brief with the state’s top court on Nov. 30. No review dates have been set. The group’s second court action protests the Lincoln Board of Appeals’ refusal to hear the group’s appeal of a permit the Lincoln Planning Board issued to the proposed wind farm. That appeal also is pending. Fill me in with a comment below!